The Canadian navy will unveil a new flag tomorrow to mark its centennial year, although it has already been flying in Victoria for more than a month. The flag will fly on Canadian warships and at naval buildings as part of a Canadian Forces campaign to raise awareness about the navy's achievements during the past 100 years. Dignitaries mark the occasion during a New Year's Day levee in Victoria, at 8:50 a.m. at HMCS Malahat, 20 Huron St. The new flag can be flown at any time on board ships and at naval buildings, although it will always be subordinate to the Canadian flag on mastheads, said Gerry Pash, navy spokesman. "It cannot take the place of any national flag or other official ensigns," said Pash. "It is purely a symbol of the Canadian navy's centennial year to commemorate the past, celebrate today and commit to the future." One of the flags has been flying at CFB Esquimalt's Duntz Head since Nov. 9, when it was raised during a ceremony with Prince Charles, the navy's honorary vice-admiral. Coincidentally, that ceremony also marked the 99th year since HMC Dockyard was transferred to control of the Canadian government, said Pash. 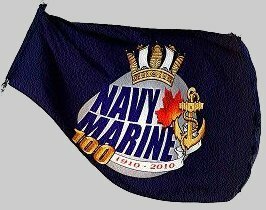 The blue flag depicts the naval crown -- a symbol common to navies throughout the Commonwealth -- atop an English and French description of the Canadian naval centennial, 1910-2010. A symbolic anchor tied with rope, called a fouled anchor, is displayed to the right of the description. The navy officially marks the 100th anniversary on May 4. Events and activities are planned across the country throughout the year. The new flag will be flown until the end of 2010.